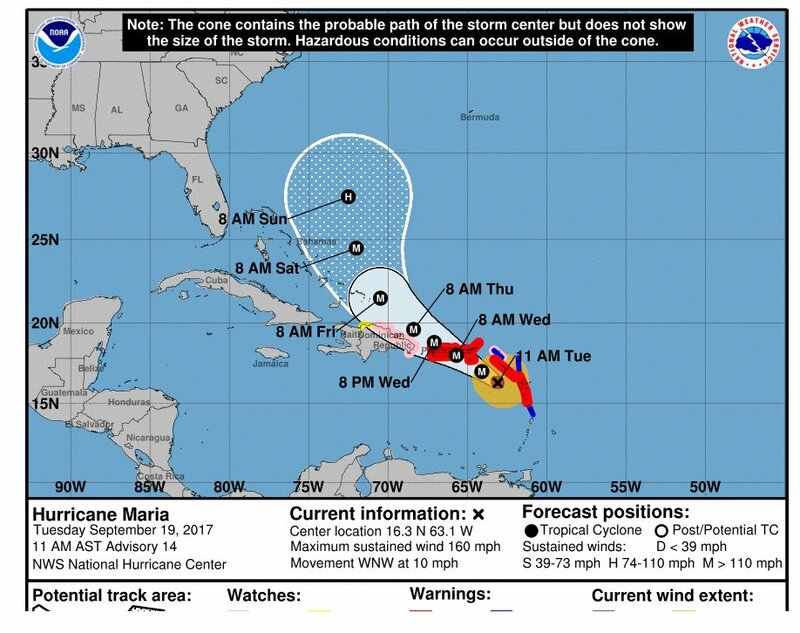 Hurricane Maria has brought life-threatening storm surges, rainfall, and wind hazards to Puerto Rico. To help supermarkets in the path of the hurricane, NGA has compiled federal resources below, and will continue to update the information. FNS worked with the Puerto Rico Department of Family to approve a Disaster Household Distribution program which began on September 26. This program will distribute high quality, nutritious, 100% American grown and produced food – USDA Foods, directly to families affected by Hurricane Maria. Puerto Rico’s Disaster Household Distribution food package will contain approximately 9-16 pounds of USDA Foods. It is expected that Puerto Rico will be able to provide assistance to approximately 500,000 families through this program. The Disaster Household Distribution Program has been approved to operate through October 27, 2017. Individuals receiving benefits under Puerto Rico’s Nutrition Assistance Program (NAP), who have been displaced due to the recent hurricanes, can apply for Supplemental Nutrition Assistance Program (SNAP) benefits in the area where they currently reside, the United States Department of Agriculture (USDA) recently announced. The policy is in effect until October 31, 2017. For the full news release, click HERE. Juice. Participants will be allowed to substitute 12, 16, and 46 ounce containers of juice, when the prescribed size is not available. Participants must still select 100% fruit or vegetable juice that meets federal standards. Fluid Milk. Participants will be allowed to substitute milk of any available fat content despite the designation of their food package. This would equate to the addition of 2% and removal of any age-related restrictions on milk. Puerto Rico WIC will also lift the restriction on flavored milk and organic. Bread. Participants will be allowed to substitute “any brand” of 16 ounce bread labeled “100% Whole Wheat” or “Whole Grain”. Participants will also be allowed to substitute 20 ounce size bread, including white bread. Participants will be allowed to substitute white bread, buns or rolls, only if the participant’s prescribed whole grain food item is not available. Baby Foods. Participants will be allowed to purchase combinations of single fruit or vegetable ingredients (e.g., apple-banana, peas and carrots, or apples and squash). However, any other types of mixtures such as infant food desserts (e.g., peach cobbler) or dinners (e.g., spaghetti and meatballs) may not be substituted as they are not consistent with the foods provided by the Program. Cheese. WIC participants will be allowed to substitute one pound of cheese for 3 quarts of UHT or dry or evaporated milk.